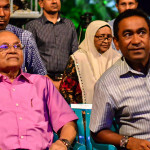 Rumors once again swirled in Malé today that former president Maumoon Abdul Gayoom is opposed to his half-brother, President Abdulla Yameen, appointing the tourism minister as the new vice president. Gayoom, however, for a second time this week, denied favoring a particular candidate. 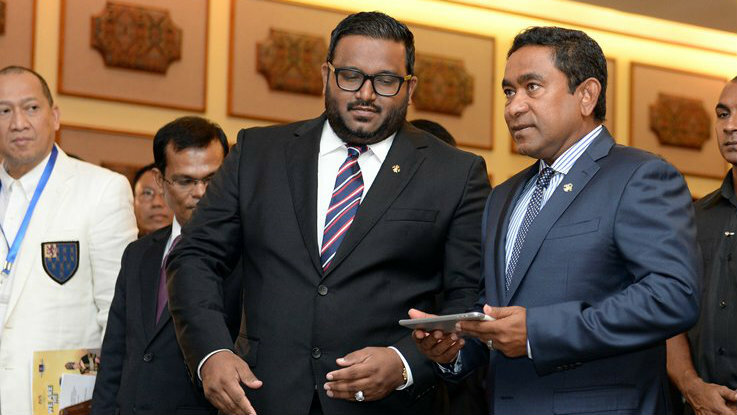 Newspaper Haveeru today said Gayoom had sent a text message to Yameen warning of negative public perception if the influential tourism minister Ahmed Adeeb is appointed vice president. The president of 30 years promptly denied the rumor on Twitter, reiterating that the appointment of a deputy is the sole prerogative of the president. “I did not send a message to the President asking him to appoint or not appoint any person as Vice-President,” the PPM leader tweeted from Oman, where he has been sent as a special envoy of the president. A vote on incumbent vice president Mohamed Jameel Ahmed’s impeachment is expected next week. Supporters are meanwhile continuing a social media campaign backing Adeeb for the position. The photo campaign has now gathered some 800 participants. But critics have questioned the need for a campaign noting the president is authorized to appoint whomever he desires to the post. President Abdulla Yameen’s silence on the new appointment, rumors over Gayoom’s opposition and the “ISupportAdeeb4VP” campaign has triggered speculation that Adeeb’s appointment as the new deputy may not be as certain as it appeared in late June, when the Majlis passed a constitutional amendment that makes Adeeb eligible for the vice presidency. The amendment sets new age-limits of 30-65 years for the presidency and vice presidency. Adeeb is 33 years old and was previously ineligible as the constitution had said candidates must be above 35 years of age. Soon afterwards, the tourism minister reprimanded Gayoom’s son, newly elected MP Ahmed Faris, for his absence from the vote. 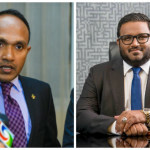 In a second text message, Adeeb told Progressive Party of the Maldives (PPM) MPs that President Yameen must be allowed to rule without internal resistance. “I have witnessed how difficult it is for HEP Yameen to rule with many frictions, I think we need to discuss this at party level,” he wrote. Faris’ absence triggered speculation that Gayoom opposed Jameel’s impeachment. Soon after Haveeru published its article today, Adeeb’s supporters took to social media expressing support for his appointment as the new presidential deputy. “The vice presidency is not reserved for individuals of a particular clan. We must change this way of thinking and allow opportunities for the younger generation,” wrote PPM member Hussain Shinan. “The current vice president has fled to London and is not doing his job. We are sure Adeeb will make a better VP than Jameel,” he said. 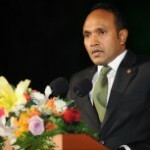 Jameel left to London abruptly the day after the constitutional amendment was passed in Majlis. A 14-day notice for him to answer charges in an impeachment motion submitted to parliament by the ruling party expired today without a written response. Rumours also spread today about the government is clearing out the vice president’s residence Hilaaleege. However, the Maldives National Defence Force spokesperson denied the claims. Yameen is reportedly seeking to replace Jameel over incompetence and disloyalty. In a meeting with the PPM parliamentary group last week, Yameen reportedly showed MPs proof of Jameel’s correspondence with opposition politicians ahead of a mass anti-government protest on May 1. In the messages Jameel reportedly asked if the opposition will let him assume the presidency if Yameen is ousted. Jameel was not available for comment at the time of going to press. In an interview with the New Indian Express, he had labeled his impeachment a constitutional coup and suggested that the international community must intervene. The PPM has secured the opposition’s backing for the impeachment motion, which was submitted with 61 signatures. A two-thirds majority or 57 votes will be required to vote Jameel out of office. The parliament has also amended its standing orders to fast track the vice president’s impeachment. The government and Nasheed’s Maldivian Democratic Party (MDP) are currently engaged in talks to resolve a six-month long political crisis. Posted on July 14, 2015 July 15, 2015 Author Ismail Humaam HamidCategories PoliticsTags Abdulla Yameen, Ahmed Adeeb, impeachment, maldives, maldives news, Maumoon abdul gayoom, Mohamed Jameel Ahmed, Vice Presdient. Previous Previous post: Comment: Will the new anti-terror bill deter Maldivian ‘Jihadists’?